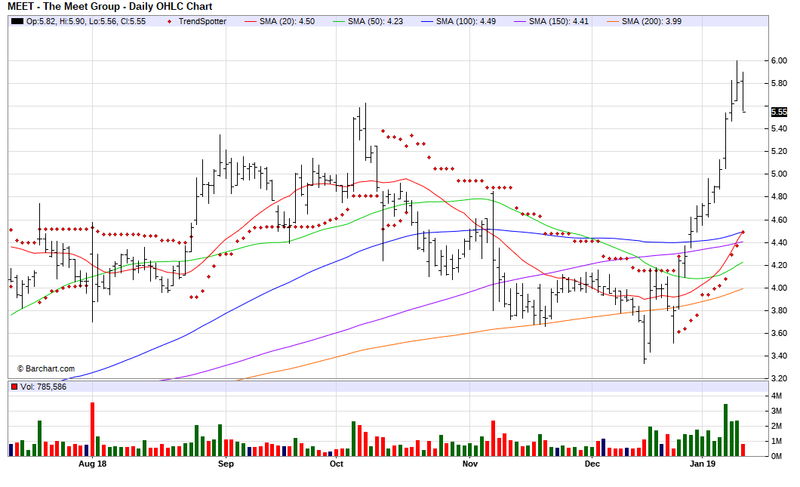 The Barchart Chart of the Day belongs to the social media company The Meet Group (MEET). I found the stock by using Barchart to sort the stocks from the Russell 3000 Index first by the most frequent number of new highs in the last month, then again by technical buy signals of 80% or more. I used the Flipchart feature to review the charts for consistent price appreciation. Since the Trend Spotter signaled a buy on 12/27 the stock gained 29.67%. The Meet Group, Inc. is a social media technology company. It offers information sharing, social interaction and mobile application development services. The company's app consists of currently MeetMe (R), Skout(R), Tagged(R) and Hi5(R). The Meet Group Inc., formerly known as MeetMe Inc., is headquartered in New Hope, Pennsylvania. Disclosure: I/we have no positions in any stocks mentioned, but may initiate a long position in MEET over the next 72 hours.